Have Wednesday lunch with us! Watch Facebook Live at noon (EST)! Be sure to catch TapRooT®’s Facebook Live session today. You’ll be joining TapRooT®’s VP Ken Reed and Implementation Strategist Benna Dortch as they bring you a workplace-relevant topic with takeaways. If you missed last week’s FB Live session, featuring Benna Dortch and Barb Carr discussing Effective Listening Skills Inventory for Investigative Interviews, be sure to tune into this one to incorporate great takeaways. 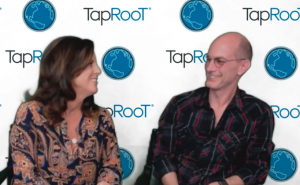 Put a reminder on your calendar or in your phone to watch TapRooT®’s Facebook Live next week for another terrific discussion and for news you can use.